Hiroshima_Toyo_Carp - TerritorioScuola Enhanced Wiki Alfa - Enhanced Search with WikiPedia Using Robots to display related resources from the web to all WikiPedia words (Video/Audio, .doc, ,pdf, .ppt, maps, edu, .html). (video) Number 18, Kenta Maeda, pitching a ball. The Hiroshima Toyo Carp (広島東洋カープ, Hiroshima Tōyō Kāpu) are a professional baseball team based in Hiroshima, Japan. They compete in the Central League of Nippon Professional Baseball. The team is primarily owned by the Matsuda family, led by Hajime Matsuda (松田元, Matsuda Hajime), who is a descendant of Mazda founder Jujiro Matsuda. Mazda is the largest single shareholder (34.2%), which is less than the portion owned by the Matsuda family (about 60%). Because of that, Mazda is not considered as the owner firm. However, the company connection is highlighted in the club name—until 1984, Mazda's official name was Toyo Kogyo Co., Ltd. (東洋工業株式会社, Tōyō Kōgyō Kabushiki Gaisha). The Nippon Professional Baseball league was scheduled to be expanded into two separate leagues in 1949, and Hiroshima prefecture decided to establish a professional baseball team as part of the reconstruction process from the devastation of the atomic bomb. The team joined the Central League in December 1949 as the Hiroshima Carp. The team's first home field was a prefecture-funded stadium, and the team's lack of sponsorship made it extremely difficult to gather players. Manager Hideichi Ishimoto had to personally scout players just to form a starting lineup. The ragtag team ended up in last place from 1950 to 1951. The team's lack of funding became an even more serious problem in 1951, and it was proposed that the team be disbanded, or merge with the Taiyo Whales team, which was based in Shimonoseki, Yamaguchi at the time. Hiroshima citizens strongly protested against disbanding the team, and raised the money needed to keep the team through donations. The Central League had 7 teams in 1952, making it difficult to form a coherent schedule for each team. Therefore, it was decided that any team that ended the season with a winning percentage below .300 would be disbanded or merged with another team. This agreement was obviously aimed towards the Carp, since the team had been in last place every season. The team won only 37 games in 1952, but ended with a .316 winning percentage to barely save itself from being disbanded. The Shochiku Robins ended the season in last place with a .288 winning percentage, and was merged with the Taiyo Whales. The team's financial plight only worsened in the following years, and the team could only issue one uniform per player in 1953. Nevertheless, the team continued to play each season, and finally ended the season above the .500 mark in 1960. The team moved to the newly constructed Hiroshima Municipal Stadium in central Hiroshima in July 1957. In 1968, the Toyo Kogyo company (since 1984 called Mazda Motor Corporation, while the Toyo name remains memorialized in the name of the baseball team) became the team's chief sponsor, and the company name was inserted to become the Hiroshima Toyo Carp. The team ended the season above 3rd place for the first time the same year, but quickly fell back into last place from 1972 to 1974. A memorial plaque listing the team's central league championships located next to old Hiroshima Municipal Stadium. Red became the new team color in 1973, and the team's uniforms were completely redone to resemble the current team uniform. The team logo was also changed from a letter "H" to a red "C" in imitation of the Cincinnati Reds logo. The team hired its first non-Japanese manager, Joe Lutz, in 1975. Lutz ordered the team's cap to be changed to red to symbolize a never-ending fighting spirit. Due to an umpiring dispute, Lutz left the team halfway into the season. However, the team won its first ever league championship in 1975 to begin a memorable series of championship berths. The Carp team became a powerhouse in 1978, hitting over 200 home runs in one season for the first time in Japanese baseball history. Koji Yamamoto, Sachio Kinugasa, Jim Lyttle and Adrian Garrett formed the powerful Akaheru (literally meaning "Red Helmet") lineup, which won two consecutive pennants and Japan Series from 1979 to 1980. A strong pitching staff led to another Japan Series win in 1984. Manager Takeshi Koba retired in 1985, but the team still won the pennant the following year. Star player Koji Yamamoto became manager in 1989, and the team won yet another pennant in 1991. However, the team fell into last place in 1993, and Yamamoto resigned from his position. After the early 1990s, the Carp would not win a pennant again until 2016. To make matters worse, the Chunichi Dragons won a Japan Series championship in 2007, making the Carp the team furthest removed from a Japan Series championship as well. View from Hiroshima Municipal Stadium on March 14, 2004. One of the major reasons for the team's recent demise[clarification needed] is the lack of financial support it receives from its sponsors. The team has never signed any free agents, and is often forced to let go of star players because they can no longer pay their salaries (recent examples include Tomoaki Kanemoto, Akira Etoh, Andy Sheets, Nate Minchey, John Bale, Greg LaRocca and Takahiro Arai). The Hiroshima Carp was the last Japanese team to have a non-Japanese player on its roster (excluding Japanese-Americans). Zoilo Versalles, the 1965 American League MVP, was the first non-Japanese player to play for the Carp. Marty Brown became the manager in 2006, becoming the first non-Japanese manager in 31 years since Joe Lutz. The team set a new record in April, 2006, scoring only 2 runs for the first 9 games of the season. Through still not finishing above third, the team concentrated on developing potential young players. In 2008, even though they were expected to finish last place as both the ace Hiroki Kuroda and slugger Takahiro Arai were gone by free agency, their chance entering of playoffs was not eliminated until the very end of the season (when only 3 games remained), and they finished fourth, closely following Chunichi Dragons. Beginning with the 2009 season, the team's home has been the New Hiroshima Municipal Stadium, also known as Mazda Zoom-Zoom Stadium, in the Minami (South) Ward of Hiroshima. The former uniforms of the Hiroshima Toyo Carp are similar to the Major League Baseball team the Cincinnati Reds. The original uniforms of the Hiroshima Carp are descendants of the uniforms worn by the University of Chicago's varsity baseball team which toured Japan in 1912 playing against major university teams. One team they played was Chuo University who copied the uniforms including the distinctive "C" logo. Alumni of the Chuo University team were instrumental in founding the Hiroshima Carp. The team mascot "Slyly" bears resemblance to the Phillie Phanatic of the Philadelphia Phillies and has been with the team since 1995. Both Slyly and the Phillie Phanatic were designed by Harrison/Erickson,Inc. The first Japanese baseball dog "Micky" was employed in 2006. Micky brings new balls to the umpire from the dugout during the game. Until 2015, Hiroshima Municipal Stadium was closed every year on August 6 in memorial of the atomic bombings of Hiroshima and Nagasaki. The team always played in other stadiums, even if a home game was scheduled for that day. The team played their first August 6 home game at Mazda Zoom Zoom Stadium in 2015. During the game all Carp players wore the uniform number 86 representing the date of the event 70 years prior, and PEACE on the front to symbolize the city's everlasting goal for world peace. 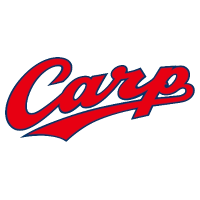 The Carp was the first Japanese baseball team to establish a baseball academy outside Japan. The team was unable to recruit non-Japanese players from the major leagues due to financial constraints, and the academy was established to cheaply send young players to play in Japan. The Carp Baseball Academy was created in the Dominican Republic in 1990, and Robinson Checo became the first player imported to Japan from the academy in 1995. Checo achieved moderate success in Japan, leading to further imports which include Timo Pérez and Alfonso Soriano. The team has a more farm team in the lower Western League. Also named Toyo Carp. The team's ball park, Yuu Baseball Ground is located approximately 20 kilometres (12 mi) southwest of Iwakuni in Yū, Yamaguchi. Built in 1993, the facility has a large main (seating for 3500) playing field with right and left bleachers (no seating in centre field) and a smaller throwing field next to it. ^ "chuo university baseball - Bing images". www.bing.com. Wikimedia Commons has media related to Hiroshima Toyo Carp.